BP on Friday announced the first oil production from the giant Clair Ridge project in the West of Shetland region. BP’s co-venturers are Shell, Chevron and ConocoPhillips. The development, which required capital investment in excess of £4.5 billion, is designed for 40 years of production. Clair Ridge is the second phase of development of the Clair field, 75 kilometres West of Shetland. The field has an estimated seven billion barrels of hydrocarbons. Two new, bridge-linked platforms and oil and gas export pipelines have been constructed as part of the Clair Ridge project. Clair Ridge is the first offshore deployment of BP’s enhanced oil recovery technology, LoSal, which has the potential to increase oil recovery from reservoirs by using reduced salinity water in water injection. This is expected to result in up to 40 million additional barrels being cost-effectively recovered over the lifetime of the development. Oil from Clair is exported to the Sullom Voe Terminal on Shetland. A new 14.6-kilometre, six-inch gas export pipeline tying Clair Ridge into the West of Shetland Pipeline Systems (WOSPS) was also installed as part of the project. The WOSPS transports gas from West of Shetland to the Sullom Voe Terminal. 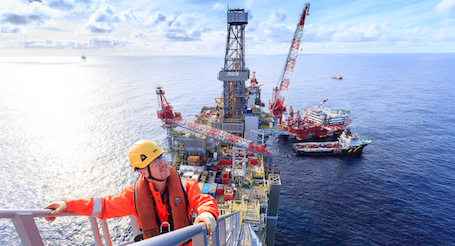 Andy Samuel, Chief Executive at the UK Oil and Gas Authority said: “First oil from the newly built Clair Ridge platform is a major milestone for the UKCS. “The Clair Field has in excess of 7 billion barrels in place and is expected to sustain production for many decades to come, with significant scope for further phases of development. “It’s greatly encouraging to see one of the basin’s original explorers using new, ambitious approaches and pioneering technology to help lead a revival in production.